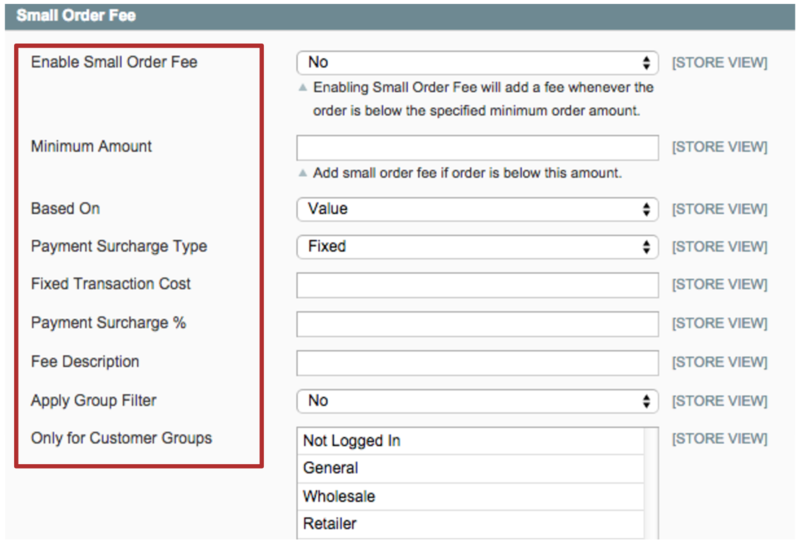 Add a fee to small orders below a specified amount. When this setting is set to Yes, a small order fee will be enabled. Enter the minimum amount an order has to reach. A fee will be applied to any order below this amount. Choose to apply the small order fee based on the order value, total number of items, or number of products. Enter the small order fee that you wish to charge as a fixed transaction cost – eg. 50 (remember not to add any currency symbols). Enter the percentage that you wish to charge – eg. 2.5 (remember not to add the % symbol). Enter the surcharge description that will be visible to the customer – eg. “Small order fee”. When set to Yes, you can choose to apply the surcharge only to particular customer groups. When set to No, the surcharge will be applied to all customer groups. If you have set “Apply Group Filter” (above) to Yes, use this setting to choose which customer groups the surcharge will apply to. Control-click to select as many customer types you wish to apply the surcharge to.